The Russian government has approved a draft agreement for a free trade zone between the Eurasian Economic Union (EEU) and Vietnam. The deal is supposed to double bilateral trade and see the EEU more involved in integration processes in the Asia-Pacific. “Implementation of the agreement will boost bilateral trade and promote trade and economic ties between the participants; it will also solve the problem of involving the Eurasian Economic Union in integration processes in the Asia-Pacific region,”saida corresponding order published on the Cabinet‘s website on Monday. The draft includes tariff liberalization between the Russian-led EEU and Vietnam that will reduce or eliminate import customs duties for most of the goods traded between the sides. At the same time, the parties will keep tariff protection for the most of sensitive commodities, which will protect the interests of consumers and entrepreneurs, said Russian Prime Minister Dmitry Medvedev. The draft also covers additional rules on hygiene and food safety regulations, technical regulation, customs administration and other rules and provisions. The final agreement is to be signed 29 May in Astana, Kazakhstan. The free trade zone between Russian-led EEU was agreed on by Russian Prime Minister Dmitry Medvedev and his Vietnamese counterpart Nguyen Tan Dung in April. Vietnam’s exports are worth $150 billion with 25 percent of it going to the US. The same goes to China and Japan, said Deputy Minister of Industry and Trade Nguyen Cam Tu. Vietnam intends to increase import and export volumes with “brother countries,” said Nguyen, possibly implying Russia. 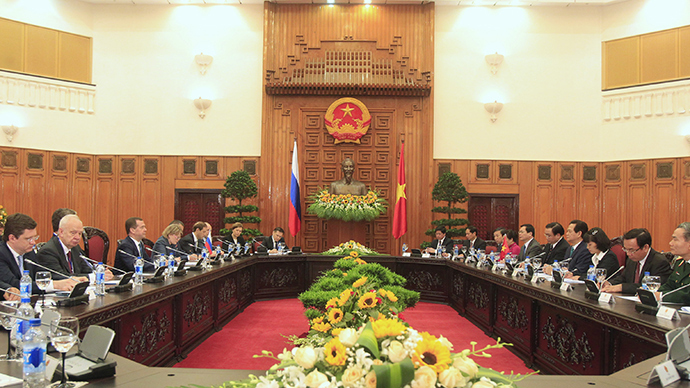 Vietnam seeks to increase trade with Russia to $10 billion by 2020, said Nguyen during that meeting. Trade turnover between Russia and Vietnam reached $3.7 billion in 2014, dropping from $4 billion in 2013, said Medvedev. Russia mainly exports to Vietnam mineral fuels, oil and its distillation products, fertilizers and imports electric machinery, nuclear reactors, boilers and knitwear. Recently, the sides agreed to enhance cooperation in the energy industry. Russia’s nuclear agency Rosatom intends to start building Vietnam’s first nuclear power plant and set up a Center for Nuclear Science and Technology, Medvedev said in April.